A real combination of art and fashion. I'm absolutely in love with these. Everything used is made from clothing. 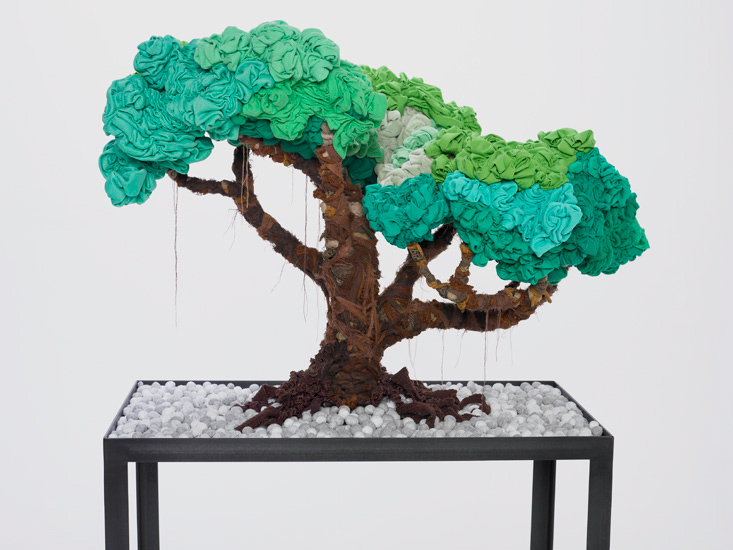 I love the artistic concept of it and the reusing of clothes and recycled objects as art. I also love the bonsai trees, so lovely, wish I could have one of those in my home! What do you think? See more of this duos work here! Also, I've got another award, YAY! 3. Pass the award onto a few bloggers who you have recently discovered. 4. 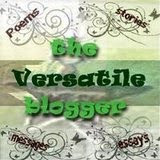 Let these blogs know that you have awarded them the Versatile Blogging Award. Uh oh, another random list about myself. haha.. I guess this is good since I can't really describe myself very well, gives me a chance to be more articulate. 1. Laughing is one of my favorite things to do. I'm so easy to make laugh. And I think everyone is really funny. And I'm so ticklish its ridiculous. haha. 2. I cannot live without french fries. They are my staple food. I don't eat them as often anymore because there not so healthy but I eat them when I can. 3. I like making people happy. So I typically have a hard time saying no to people especially those I love. But I'm working on that! 4. I believe that every person has the potential to be better, and improve their own circumstances, whatever it may be. 5. I think that every human being needs to love themselves first. I know, I know, so cliched or whatever, but true. 6. Sometimes I just want to be a singer. I love to sing, and it makes me happy when I sing. Although, I can't remember lyrics unless I really read the lyrics and repeat it everyday, but some days I wish singing could be my occupation. 7. I love collecting random notebooks, and stationary things. Even though most times I never ever completely finish using a notebook. Well, I do for my personal journal. And if you have read all of this so far, congrats and thanks! :) But I also got my IFB account up and running, visit me and friend! For some reason, I can't friend anyone! Any suggestions? Probably the longest post ever. wow, amazing photos! So inspiring! thank u for your comment on my blog. You're so lovely and your blog is real cool! I love the last tree especially! #4 and #7 things about you: YES. I have way too many notebooks...usually with like, just one page written in them. and #4, mmhmm, I agree. I wish more people realized that. Wow that looks great.. amazing colors...! Wow, those bright colors are AMAZING! wow, amazing photos. 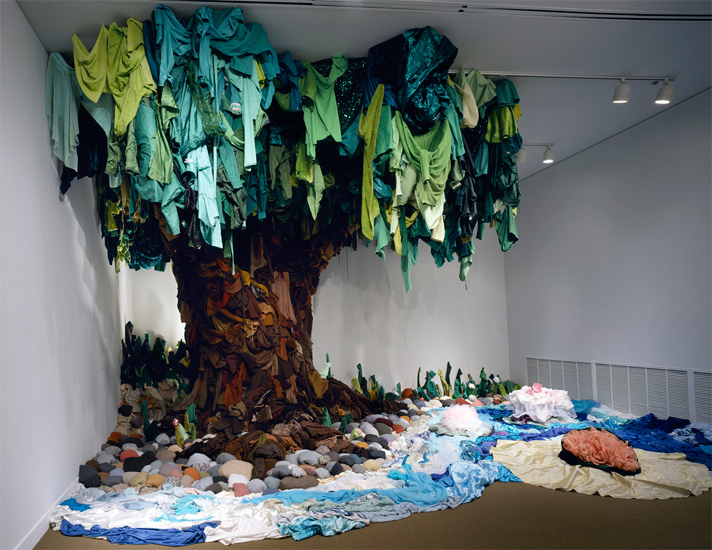 that is such a cool idea, mixing clothes with art. wowza! that is sooo neat! my fave is the first picture sooo unique! thanks for following my blog and of course i will be following you as well! How freakin' fantastic is that first photo? Oh, I just love that rainbow going on. Oh my gawd, that duos work is ingenius. 2 of my favorites things: Art & Fashion. 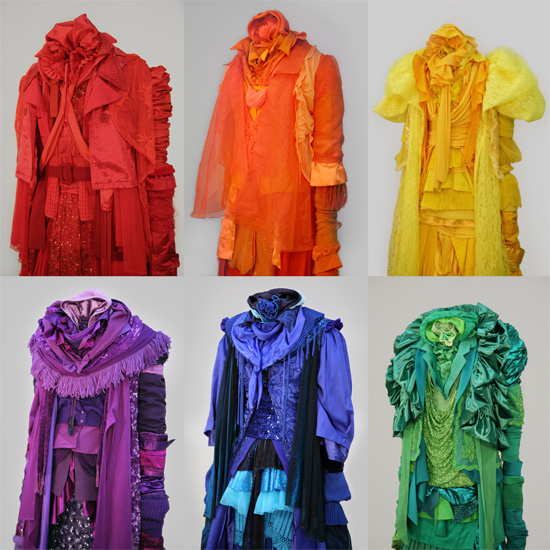 Recently i've make some photos about Adeline André's Work, the juxtaposition of stoles, colors, i'm loving it. Wow, what a concept! I just love the bold colors in the pieces. Btw, I just started Eat, Pray, Love too. So far, so good! This art is AMAZING as is your blog, keep up the greatness! This is totally amazing, I'm really captivated by the concept and the use of color. What an interesting work! Secondly, congratulations on the award, it's well-deserved! that art installation is just freakin' awesome!!! love the colors...and all the shades of green! Kelly these are beautiful! Congratulations on your award!!! these r amazing ive nevr seen n ething like it. What!? I want those all in my house too! So cool! Gratulations on winning this award! Check out my new post inspired by kirsten stewart. WOW - beautiful images - they are amazing, and so creative! Great post! i love the mountain of colorful clothing! 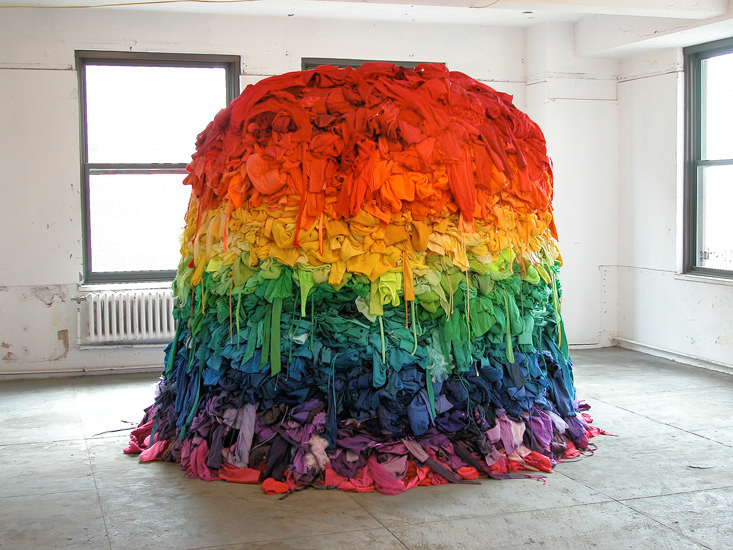 that rainbow clothing pile makes me happy every time i see it. also, i consider french fries their own food group. How incredible! love that tree! OH-MY-GOSH! I am truly fascinated by this. What an amazing find and incredible work of art! They are all so interesting to look at. Thanks for posting this! Amazing photos and beautiful pieces. I LOVE those works. So beautiful. Wow, this photos are AWESOME! Do you like soft fries or crunchy fries better? Haha. I prefer crunchy!